Added a new powerful controller remapping and calibration screen. Most game controllers, including custom controllers and r/c transmitter USB interface controllers, can easily be configured to work perfectly with RC-AirSim. 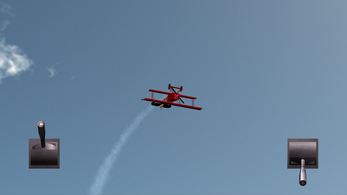 Realistic engine smoke trails added to the following planes: Back 40 Trainer, F-15 Regal Eagle, Super Dee, and the World War I Flying Aces 1 & 2. 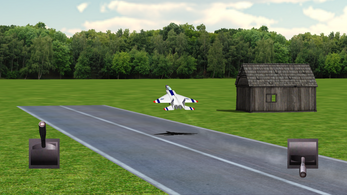 Music added to the main menu will inspire you to be Top Gun of the model airplane field! 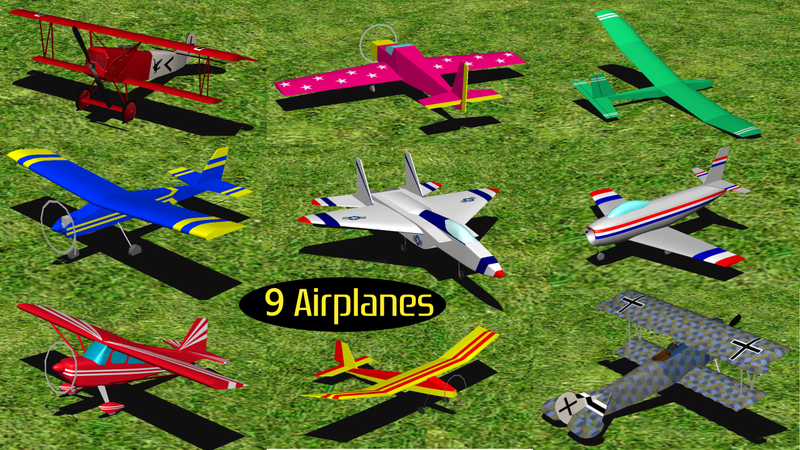 9 model airplanes to fly including: F-15 Fighter Jet, WWI Biplane, Glider, Electric Parkflyer, Aerobatic Planes, and a Trainer. Powerful controller remapping and calibration feature so almost any controller is compatible. Accurate landings and ground handling. 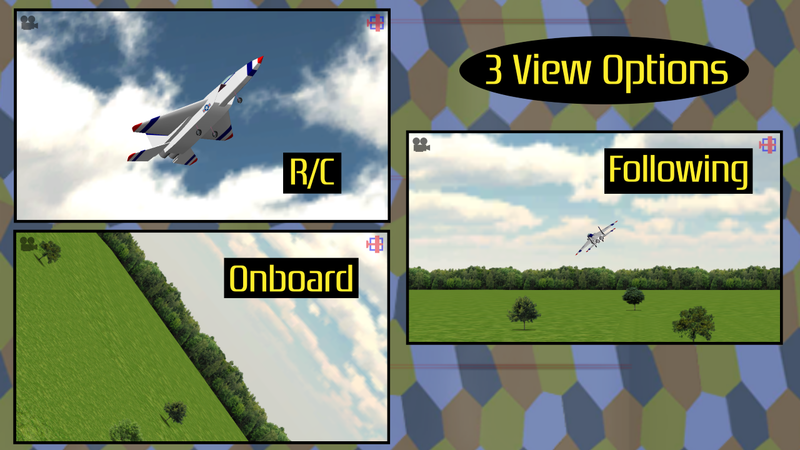 3 view options - R/C (Line of Sight), Following (Chase cam), and Onboard camera (FPV). Click camera icon to change. 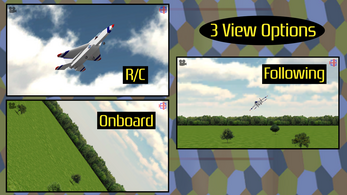 4 channel controls - aileron, elevator, rudder, throttle. 3 control modes: Mode 2 (default), Mode 1, and 3 Channel. 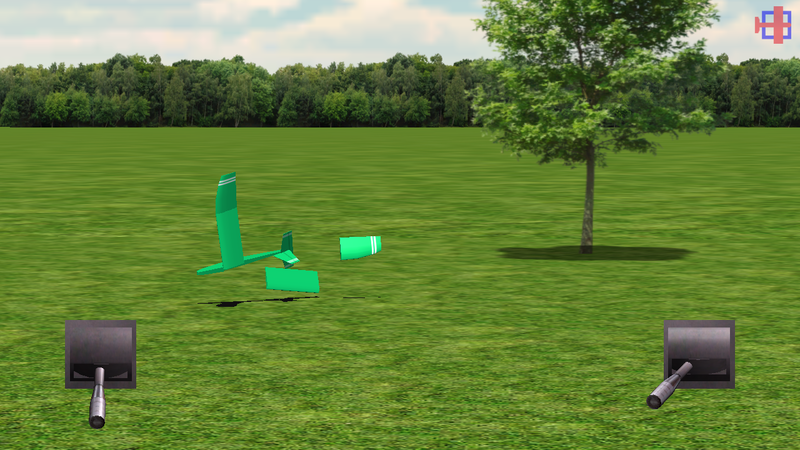 Field objects to avoid and fly behind. Get flying quickly! No slow, tedious menus or multiple load screens. F-15 Regal Eagle - Large gas powered ducted fan military jet. 4 Channel control. WWI Flying Ace - Electric scale biplane based on the historic World War I Fokker D.VII. 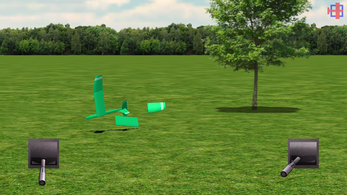 Moving control surfaces and spinning prop. Comes with two paint schemes: Red/White or Blue/Green Lozenge. 4 Channel control. 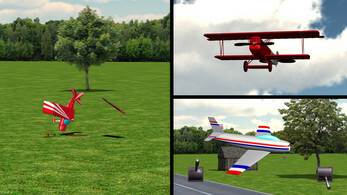 Back 40 Trainer - Classic 4 channel high-wing trainer with plenty of dihedral for beginners. Powered by a .40 size gas engine. Slowmowatt - Electric park flyer. Flies very slow so there is plenty of time to react. Easiest to fly! Perfect for beginners using the 3 Channel control scheme. 4 channel control available. Double Helix - Low wing electric sport plane. A great choice for beginning aerobatics. 4 Channel control. Madster EDF - Small sport scale electric ducted fan military jet. 4 Channel control. 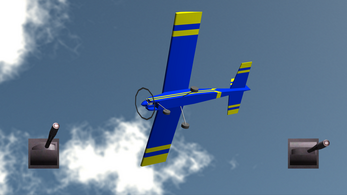 Super Dee - Large high wing tail-dragger aerobatic sport plane. Gas powered. Great for low inverted passes! 4 Channel control. Emerald Glider - Classic 2-meter wingspan glider. 4 Channels - use the 'throttle' channel to adjust your drag. For rudder/elevator controls only (no ailerons), fly using 3 Channel control scheme. Questions? Comments? Suggestions? Don't hesitate to contact the developer directly. Happy Landings! 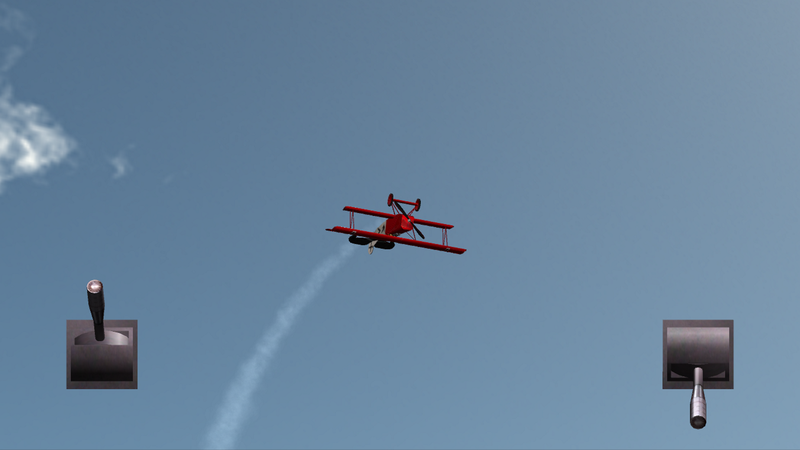 RC-AirSim is also on Steam!